Camp aside, favourite to win is Shakira-alike Emmelie de Forest representing Denmark. Accompanied by drums (drums are very popular this year) and pipe, ‘Only Teardrops’ has a rousing sweeping feel to it and ticks all the boxes for what makes a Eurovision winner. And, of course, the Scandinavian nations usually do really rather well at the competition. Another favourite is Anouk from The Netherlands. Anouk is one of the biggest stars in her home country and has had success abroad. ‘Birds’ is probably the most un-Eurovision song in the contest and has a melancholic 90s feel. Popular at Hologram Tiger HQ are the energetic, kilt wearing Koza Motra featuring Agathon Iakovidis from Greece with a cocktail of ska and rebetiko - ‘Alcohol is Free!’. Koza Motra are the Mediterranean’s answer to Gogol Bordello, combining traditional and modern with raucous gusto. Koza Motra sound like the climax of a party, especially one where alcohol is free! The UK’s Bonnie Tyler will always be dear to me thanks to dramatic classics such as ‘Holding Out For A Hero’. Tyler’s effort for Eurovision, ‘Believe In Me’ is a slow ballad which will have no demand for pyrotechnics and acrobatic half-naked dancers when performed at the final which is a cause for disappointment at Hologram HQ. Bonnie Tyler has a huge following in Europe, including Russia, so the UK have a chance of doing OK (and I mean just OK). There will be colourful parties all over the UK and Europe tonight. For those of you in London who are still at a loss on how to embrace the Eurotastic tonight, events include a live screening at The Roxy in London Bridge where they will be serving Eurovision-themed cocktails all night. And at Bethnal Green Working Mens Club, there’s the fun-packed Eurodisco hosted by Trixie Malicious and Rod Lightning. 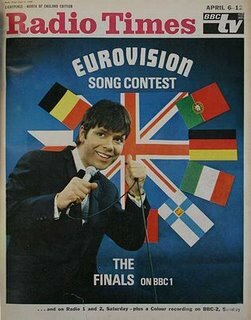 The Eurovision Song Contest Final kicks off at 8pm tonight on BBC1. Dust off your glitter and spandex, pour yourselves a strong tipple produced by your favourite nation and make it a party worthy of a massive DOUZE POINTS!